In the year 1992 the company Photopak SA of Alcorcón, Madrid, Spain, decided to import 8 bits videogames and consoles without license from Taiwan to sell them in the Spanish market. 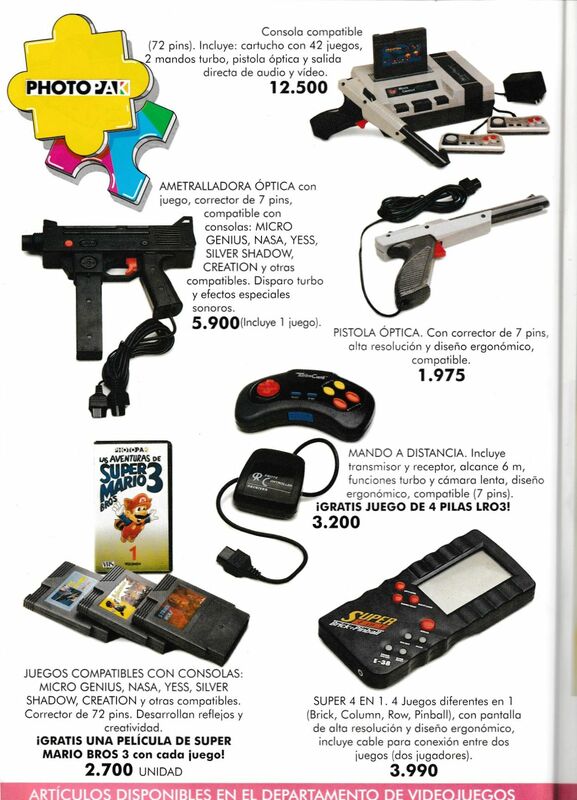 Initially they imported games and consoles( Hypercor Ads Dic-1992), sin haber creado una marca propia. They imported consoles like Micro Genius, Yess and Nasa. They also imported games, some of them later rereleased with the Gluk brand, like "Policeman", "Creatom" o "F-15 City War" (from their first batch with TXC/Micro Genius). To the end of 1992 they started to bring them with their own brand, for this they created the Gluk Video brand. This videogames and consoles were sold on hypermarkets like Continente, Alcampo, Pryca and Hipercor, also on local sotres, bazaars and similars, also seen for rent on videoclubs. They were also sold by mail through the catalog Discoplay. Judging by the barcodes from the consoles, it seems they first imported the consoles and later the games, the last console was their own, the Silver Shadow Basic S-500. Their activities on the videogames industry continued at least until the 1994 christmas. Nintendo sued them for unfair competition on their videoconsole importations. The resolution states that the similitude of the consoles NASA SILVER and YESS with the NES, the inclusion of a game cartridge with games copyrighted by Nintendo and the similitude of the gun with the ZAPPER were the motive for the demand. Gluk Games were sort of popular basically because of it's low price and the Spanish title on some, as the imported consoles, that could cost half than an original NES. In the southern regions of Spain the games sold really well. I haven't find any mention to these games on the magazines of the sector during that time. We could say that they were the games "of the people", they were known but were not mentioned in any official publication. For a lot of people this was the beginning with videogames by approaching to them on a cheap way. By the 2005, more than a decade after their publish, Gluk started to be seen on the Internet. The interest for the brand grew up after stating that the games were not pirate but unlicensed, that is, original games published legally on Spain. This caused a "Gluk bubble" by the collectors around the world that caused a high rise on the prices. Coming to see copies for more than 300€. Actually, although still with high prices (30-90€) they are starting to go down because the majority of the demand of the collectors it's already covered. There are sealed copies of "La Alfombra Magica" and "El Monstruo de Los Globos" that are sold for roughly 30€. At July/2017, a new Gluk game has seen the light, it is: "Comando de Lobos".